Most doctors recognize that healthcare’s “starting line” moved some time ago. Increasing emphasis on wellness, prevention and healthy living. But…few doctors embrace the social media opportunity. As a rule, doctors tend to embrace technology, and, as users, they are often Early Adopters for things Internet and information resources. A smartphone and tablet are as ubiquitous as the standard issue stethoscope. “As a multi-year participant in social media, I see more benefit and opportunity than risk. Here are five factors to consider while pausing at that fork in the road. 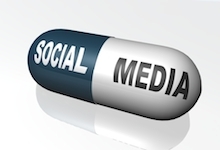 “First, consider the blank-slate status of the playing field for health care social media. Beyond common sense and decency, there are few rules. Digital natives—like me, and perhaps you—will make the rules. Pause for a moment here and consider that idea: making rules rather than following them. Sounds good, doesn’t it? “Second, as a doctor, you are different. People will listen to you; your voice matters. What patients really want to read is what their doctor says. “Third, social media can be therapeutic. It’s an understatement to say morale amongst caregivers is low, and sinking lower. What’s more, the social aspect of social media connects you with colleagues across the world, not just your hospital’s doctors’ lounge. I regularly connect with colleagues in Germany, Australia, and the UK. As a full-service healthcare marketing company, you could take our advice about social media. But this personal and professional perspective of a practicing physician—candidly presented advice of one doctor to another—is potentially more powerful and valuable guidance.